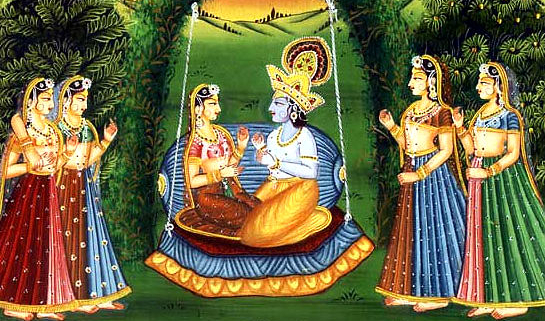 In the forest of Vrndavana, Vrnda-devi engages peacocks, parrots, cuckoos, and doves to sing, and finally the old monkey “Kakkhati” to speak to awaken Radha and Krsna. The Divine Couple leave Their flower cottage and hastily and secretly return to Their homes in Javat and Nandagrama. Radharani in Javat and Krsna in Nandagrama are awakened by Their superiors who are completely unaware of the preceding night’s events. Krsna greets His cowherd friends and goes to the cowshed to milk the cows. Meanwhile, Radha, splendidly bathed and dressed, proceeds with Her gopi friends to Nandagrama to cook Krsna’s breakfast. After milking the cows and joking with His friend, Krsna bathes, dresses and enjoys breakfast while surrounded by Sri Baladeva and His boyfriends, Madhumangala, Subala and Sridama. Sri Govinda and His boyfriends take the cows out to eat the soft, sweet grass at the bottom of Govardhana Hill. The boys frolic in the forests, bathe happily in Manasi Ganga and enjoy eating tasty snacks of fruits and sweets. Missing Sri Radha, Krsna tricks the boys and slips away to nearby Kusuma Sarovara. 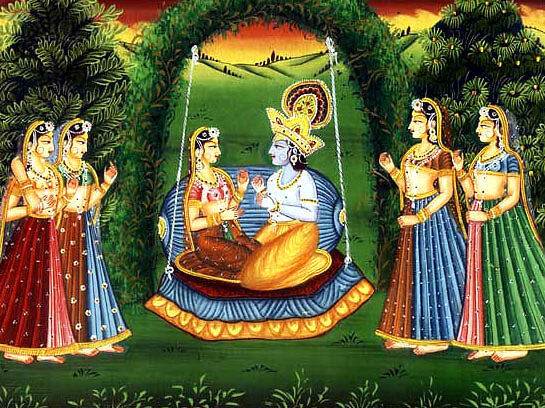 Here, Krsna meets with Subala, Madhumangala, Dhanistha-sakhi, Vrnda-devi and Tulasi to arrange for His impending rendezvous with His beloved Radhika. 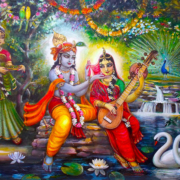 Radha and Krsna meet and enjoy unlimited nectarean pastimes in Radha-kunda, and in the surrounding forest grove’s belonging to Radha’s dearest friends. Radha and Krsna dispute over flower picking, They ride on a lotus swing, stroll through the six seasonal forests, engage in color squirting wars, water splashing contests, flute stealing, decorating one another with flowers, drinking honey nectars and eating forests fruits, playing board games, resting on flower petal beds, hearing parrots sing Their glories and Surya-puja. Sri Radha returns home to Javat, bathes, dresses gorgeously, and begins cooking delicious sweets to send for Krsna’s evening repast. Playing His flute, Sri Krsna calls the cows by name and leads them home to Nandagrama. Yasoda and Rohini organize the kitchen to produce many sumptuous offerings for Krsna’s pleasure. Krsna and Balarama bathe, dress and relish the sweet snacks sent by Srimati Sundari (Radha). Krsna then milks the cows, or alternately goes to the Yamuna to sport with Radha. After Nanda Maha¬raja’s sandhya-arati Krsna and all His boyfriends eat supper in a joking, festive mood. Yasoda sends Krsna’s remnants to Radha who eagerly honors them. In Nanda Maharaja’s palace auditorium, Krsna is entertained with dramas, dancing, recitations, instrumental music, Vedic mantra chanting, and a magic show. Afterwards, Mother Yasoda feeds warm milk to Krsna and sends Him to bed. Meanwhile in Javat, Radharani is dressed in beautiful clothes with colors coordinated to the moon’s phases—wearing white garments during the light moon and blue cloth during the dark moon. Accompanied by Her intimate gopi friends, Sri Radha travels to the assigned kunja (forest grove) on the bank of the Yamuna for Her rendezvous with Syamasundara. Krsna feigns sleep, assigns a couple of boyfriends to guard, locks His door from inside, and secretly slips away to meet Radha. Singing responsive songs, Srimati Radhika, Sri Krsna and the gopis wander throughout the Vrndavana forest along the Yamuna River. The amazing rasa dance begins with thousands of gopis beside thousands of Krsnas, all whirling and spinning gracefully in indescribably wonderful circular patterns. Vrnda-devi distributes musical instruments, and hundreds of gopis begin playing complex rhythms on vinas, mrdangas, flutes, finger cymbals, stringed and wind instruments. All the musical instruments blend sweetly together. The tempo gets faster and faster. The tunes become more and more complex. And the dancing becomes more and more frantic, as the gopis sing thousands of varieties of songs. Krsna admires the melodious compositions of all the talented gopis. Srimati Radharani brings the topmost happiness to Sri Krsna by enacting a special dance that no one else could possibly imitate. After the exhilarating rasa dance Radha, Krsna and the gopis refresh Themselves with inebriating fruit and honey nectar drinks. Then They relax upon luxurious natural beds made from flower petals and lotus stems. To further mitigate Their transcendental fatigue and to enjoy more pastimes, Radha, Krsna and the gopis dip in the Yamuna for a sportive water fight. Vrnda-devi provides fresh cloth and decorations for Sri Radha and Sri Krsna. She then brings the Divine Couple to Their resting temple, where The enjoy some fresh forest fruits before retiring for pleasure pastimes.